At some point in their lives, most people will experience the profound ennui that comes from raising a piece of pancake to their lips, feeling the velvety texture of it roll around in their mouths, and swallowing, only to be left with the unshakable feeling that something—something important—is missing. 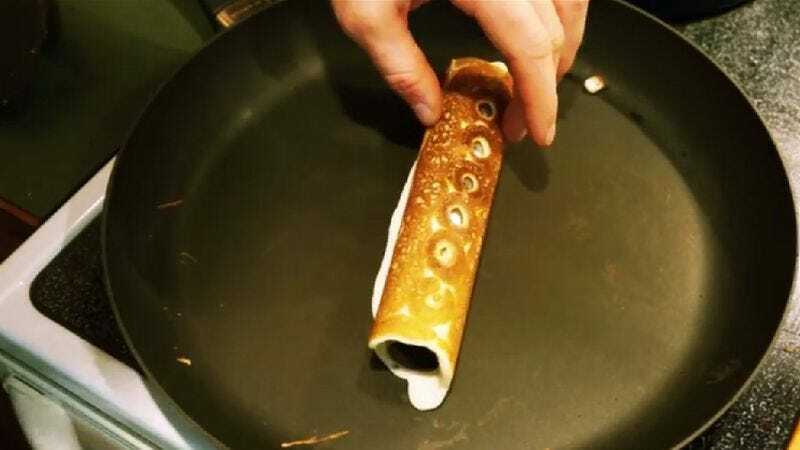 With this instructional video detailing how to make a working flute out of a pancake, math teacher, father, and dreamer Nathan Shields may have provided the answer to this everyday existential dilemma. Not unlike Thomas Edison and his many failed attempts to create the light bulb, Shields does not make a fully operational pancake flute on his first try. But by the third time around, he has perfected the timing, procedure, and batter schema necessary to create a functional musical instrument/brunch staple to share with his children, and with the world. You must provide your own woodwind mouthpieces.